OMEGA® Pressure Volume Controllers provide an easy-to-use means of rapidly and accurately adjusting the pressure in a closed system. These pressure controllers provide the ability to precisely adjust pressure within 0.00025 psi. When used with digital pressure gauges, dial gauges, transducers, pressure switches, air deadweight testers, manometers and other similar devices, they provide a fast and accurate means of setting a precise pressure. 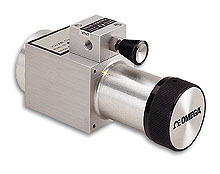 OMEGA Pneumatic Controllers are available for use with pressures up to 3000 psi. Engineered to provide superior performance and safety, these devices incorporate a unique pressure balance valve. This valve is opened during initial system pressurization. When opened, the valve provides equal pressure to both sides of the piston assembly. After the system has been pressurized, the valve is closed. When the valve is closed, a change in piston position will result in a change in the pressure within the system. Simply turning the large pressure adjust knob repositions the piston to increase or decrease the pressure. Equalization of pressure on both sides of the piston assures ease of pressure setting. In addition, the valve performs a safety function. The balance valve will open automatically if an excessive pressure differential is generated across the piston. In essence, the valve serves as a safety relief valve and protects the controller from damage due to excessive pressure differentials within the unit.